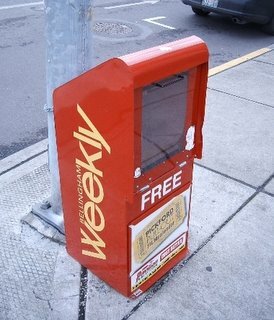 Editorials from Theslowlane: Demise of the Bellingham Weekly? Demise of the Bellingham Weekly? Maybe I am "kicking a dog when she's down," but I must say I didn't read much of the Weekly while it was publishing. Recent headlines in other media, such as the Whatcom Independent, have brought news of problems at the Bellingham Weekly. Financial difficulties and some conflict between co-owners. A bit too complicated for me to try and contemplate. Maybe it will rise again. I just know that there are a lot of alternative publications around town, not to mention (of course) blogs and web sites. I think Bellingham Herald has been the largest over the years, but I once heard that Bellingham Weekly printed more copies. It was offered free around a large area of Northwest Washington, published weekly while the Herald is by subscription and published daily. The Herald has a good amount of it's content on-line for no charge. Maybe one could view the Herald as the "big corporate owned ship." It's a ship around which the various alternative papers swim. Ironically, I still find the "mother ship" can be most interesting. Being daily, it has the most "elbow room" for printing letters to the editor and including lots local people in the news. I have a big interest in the "city planning" news. That seems to be strong in both the Herald and the Whatcom Independent. I got the feeling that there was an attitude, around the Weekly, (also around many weeklies in other cities) that the "world is going to hell in a hand basket." "Corporations and the military industrialists have taken over so we might as well head down to the local pub and drown our sorrows in the latest micro brew." Thus, weeklies will often lean toward arts and entertainment news. Rock bands at local bars and so forth. Sometimes I find the club scene a bit alien. Nothing wrong with it, however. Everyone has their own set of tastes. Bellingham has a lot of publications including a glossy magazine called Entertainment News Northwest. One should also remember "The Betty Pages," put out monthly for alternative lifestyles by local drag performer Betty Desire. There are business papers and college papers and many other kinds of papers. As for "elbow room" one finds plenty of that on the net. I sometimes wonder if "paper" media is becoming too limited, in this age when there are so many voices. Too many voices for the money and space of "paper" pages? The Internet is sort of like "infinite space." There is plenty of room on the Internet, but does it make one "a lost voice in the wilderness?" Search engines are amazing things. Amazing at matching up ideas and enthusiasts. A way to reduce that "lost voice in the wilderness" thing. Search engines tailor the media to you. Speaking of you, Bellingham used to have a paper by that name. That was before the Internet days. Back then, I was in college, I lived at a rooming house on High Street. The new publication called "YOU," "You Magazine," or something like that was around. It must have felt that it was "The News Tailored To You." One day, my rooming house manager found copies of "You" arranged in a fan on the floor. It was in front of the main door. Someone had distributed the paper in a fan, rather than a pile. There was one copy for each room in the house. The manager said, "What on earth is this?" because it was in the way. She gathered up the fan and said, "We only need one." A new version of The Weekly has started up again (Spring 2006). Called "Cascade Weekly." It seems better than the former weekly. A bit more planning news or at least not quite as garishly entertainment oriented.